A free acoustic performance will set the mood for the time-honored classic Citizen Kane, screening at The Tull Family Theater on Tuesday, Nov. 6. 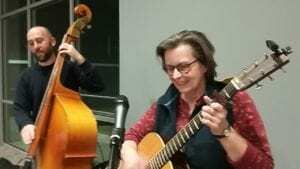 Guitarist and vocalist Meg Smith of Hopewell Township and bass player John Heid of Coraopolis will perform classics and ballads starting at 6:30 p.m. Tuesday, before Citizen Kane rolls at 7:30 p.m. Smith, a seasoned performer, has played at the Laughlin Memorial Library’s Music Mondays in Ambridge, at Ss. Peter and Paul Church in Beaver and other area venues. Citizen Kane will encore on Wednesday, Nov. 7, at 11:30 a.m. The following week, in honor of Veterans Day, the Theater in Sewickley will show Saving Private Ryan on Sunday, Nov. 11, and Monday, Nov. 12, at noon on both days. Veterans and active military will receive free popcorn for the Saving Private Ryan screenings and are eligible for discounted admission ($8.75) 365 days a year!